Join master storyteller Donna Washington for an engaging evening of storytelling. 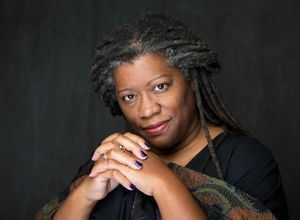 Master storyteller Donna Washington graduated from Northwestern University with a Bachelor’s of Science in Speech in 1989. Since then she has traveled across the world performing as a storyteller and presenting workshops about the inextricable link between storytelling and literacy. She has been featured at the National Storytelling Festival in Jonesborough, TN as well as hundreds of festivals across the country. She has performed in thousands of schools and libraries, and keynotes conferences about the importance of storytelling and early literacy, using hospice stories for healing and closure, and employing storytelling as an educational tool in the classroom. Washington writes a popular storytelling blog called Language, Literacy and Storytelling, and contributes pieces to other blog sites as well. Donna is also a member of the editorial committee for the National Association of Black Storytellers, and has served as president of the North Carolina Storytelling Guild. Sponsored by Friends of the Port Townsend Library and Centrum’s Oral Storytelling Workshop http://centrum.org/oral-storytelling-workshop/.